Squamous cell carcinoma (SCC) is a common type of skin cancer. It is derived from squamous cells, the flat cells that make up the outside layers of the skin, the epidermis. These cells are keratinising i.e., they produce keratin, the horny protein that makes up skin, hair and nails. Invasive SCC refers to cancer cells that have grown into the deeper layers of the skin, the dermis. Invasive SCC can rarely metastasize (spread to distant tissues) and may prove fatal. Invasive SCCs are usually slowly-growing, tender, scaly or crusted lumps. The lesions may develop sores or ulcers that fail to heal. Most SCCs are found on sun-exposed sites, particularly the face, lips, ears, hands, forearms and lower legs. They vary in size from a few millimetres to several centimetres in diameter. Sometimes they grow to the size of a pea or larger in a few weeks, though more commonly they grow slowly over months or years. When the cancerous cells are confined to the epithelium (outside layers of the tissue), the lesion is called SCC in situ. SCC in situ of the skin, intraepidermal SCC, is also called Bowen disease. Keratoacanthoma – a rapidly growing keratinising skin nodule that may resolve without treatment. 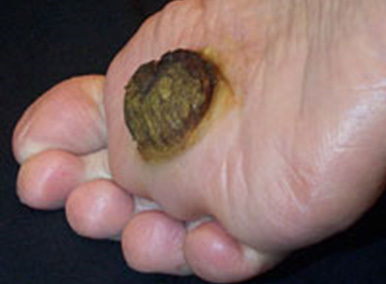 Carcinoma cuniculatum (‘verrucous carcinoma’), a slowly-growing warty tumour found on the sole of the foot. What is the cause of SCC? Inherited predisposition to skin cancer. Smoking – especially SCC of the lip. Immunosuppression from drugs such as ciclosporin or azathioprine, especially in organ transplant recipients. Infection with human papillomavirus (HPV), the cause of viral warts, genital warts, and many mucosal SCCs. It is the cause of carcinoma cuniculatum but rarely causes other forms of cutaneous SCC. High risk features of the primary tumour include depth >2mm, perineural invasion, location on ear or nonglabrouslip, and poorly differentiated or undifferentiated tumour on pathology. The treatment for SCC depends upon its size and location, the number to be treated, and the preference or expertise of the doctor. Patients with larger or aggressive lesions, or one in a difficult site, may first require imaging with ultrasound, CT or MRI to determine the extent of the tumour and to look for metastases in the regional lymph nodes or elsewhere. Invasive SCCs are usually excised, i.e., a full thickness surgical procedure to cut out the lesion completely. Mohs micrographic surgery may be necessary for large, ill-defined, deep or recurrent tumours. After excising a large tumour, the dermatologic surgeon or plastic surgeon may create a flap or graft to repair the defect. Radiotherapy or radiation treatment refers to treatment using X-rays. It is sometimes used for high risk primary skin cancers on the face and for metastatic disease. Treatment is usually curative. Occasionally, SCC recurs at the same site, requiring further treatment with surgery or radiotherapy. Patients with SCC are at increased risk of developing further SCCs. They are also at increased risk of other skin cancers, especially basal cell carcinoma and melanoma. Arrange a complete skin examination from time to time. Ask your dermatologist or GP to check any persisting or growing lumps or sores or otherwise odd-looking skin lesions. Early detection means easier treatment, and less scarring. Protect your skin from excessive exposure to the sun. Stay indoors or under the shade in the middle of the day. Wear covering clothing. Apply broad spectrum sunscreens to exposed skin if you are outdoors for prolonged periods, especially during the summer months. In 80% of cases, the metastases develop in the nearest lymph glands. Metastases are more difficult to treat than the original skin lesion. Many thousands of New Zealanders are treated for SCC each year, and about 100 die from their disease. DermNet does not provide an on-line consultation service. If you have any concerns with your skin or its treatment, see a dermatologist for advice.